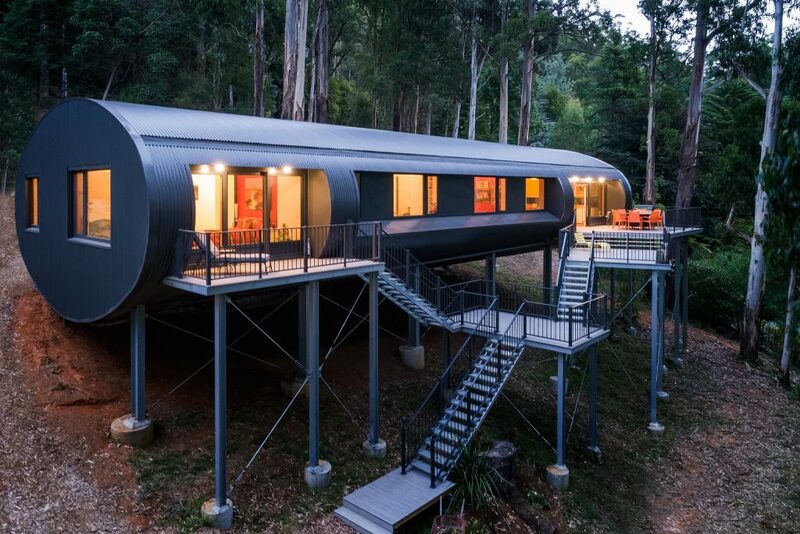 Maxa Design received two commendations in the BDAV’s 2018 Building Design Awards for their Kallista project in Victoria’s Dandenong Ranges, which has received a lot of media interest, given it is very unusual and eye catching. The commendations were for Best Energy Efficient Design-Residential and for Excellence in Use of Steel. That this compact home blends into its environment, and is a stand-out design, is testament to the many constraints that have inspired this creative outcome. When a client brief specifies a residence that is ‘soft, round and warm’ it is stating the obvious to add they were looking for something a ‘bit different’. The challenge presented to building designer Sven Maxa from Maxa Design was one he was well equipped to handle. Looking locally for inspiration, it was a charred fallen log on the home’s bushland site in the Dandenong Ranges that inspired the eventual design’s striking elliptical form. To support the client’s desire for an accessible home – a home that accommodates all ages and all abilities – into their retirement, Sven opted for a compact single-level floorplan, a solution that marries curves and pragmatics. Sven was also working to required bushfire design regulations, as the need to minimise the potential danger of natural disaster was just one of the many constraints that had to be managed. Bushfires are a real threat in the Ranges and Sven’s rounded structure solution prevents leaf litter build up and supports ember shed. Maximising the view and ambience of the surrounding bush environment was also a key requirement for Sven’s clients. While today the couple can look out any window of the finished residence and feel they are living amongst the treetops, this relative ease of leafy access took much behind-the-scenes activity. Local Council regulations required the established grey gums on the site to be maintained, which, alongside the steep gradient, limited the ground space available for building. Maxa Design’s solution elevates the single level home to traverse these challenges. The building projects out from the land’s highest point into the forest, and is supported by steel poles. These had to be anchored to the sub-soil rock to ensure stability in case of land slip – another very real danger given the site’s pitch – but this solution meant the design team could protect the landscape. The dense overarching tree canopy presented another challenge as it obstructed the sun, limiting solar access to the home and potentially causing condensation issues. Employing Passive House design principles and construction methodologies including a ‘magic box’ heat recovery ventilation/hot water/heating and cooling unit – one of the first in Australia – resolved these issues, explains Sven. Passive house methodologies carefully control insulation and air leakage, building orientation and shading, and recovery and filtration of indoor air to manage temperature and air quality. A certified passive house’s performance can be measured precisely, with air quality and heat loss and gain data tracked over time. The first passive house was built in Austria in 1991. The project ticks many boxes to achieve a residence that has met council, fire safety, and environmental requirements, as well as the client’s lifestyle and aesthetic needs. The ‘smart technology’ resolves ventilation issues and helps maintain a comfortable and constant ambient temperature through seasonal fluctuations. But what makes Sven happiest about this project is that his clients are “really ecstatic” about their new home, he says.